North Dakota is being threatened by three noxious weeds that could infest more acreage in the state and at a faster rate than leafy spurge. Members of this trio include spotted, diffuse, and Russian knapweed. These three knapweeds already infest more acreage than leafy spurge in Montana and Minnesota, and have been found in over 20 counties in North Dakota. Knapweeds are related to thistles and can spread even faster. North Dakota is being threatened by three noxious weeds that could infest more acreage in the state and at a faster rate than leafy spurge. Members of this trio include spotted, diffuse, and Russian knapweed. These three knapweeds already infest more acreage than leafy spurge in Montana and Minnesota, and have been found in over 20 counties in North Dakota. 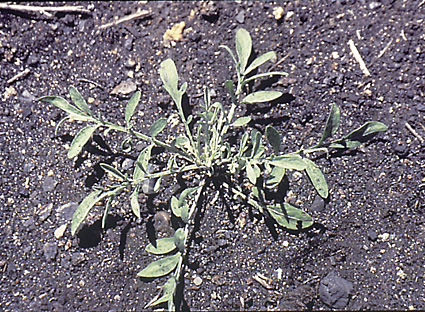 Knapweeds are related to thistles and can spread even faster. For instance, spotted knapweed infested approximately 25 acres in eight North Dakota counties in 1984; by 1997 it had spread to more than 1,000 acres in 14 counties, and was found in 18 counties in 2017 and infested more than 30,000 acres. Diffuse knapweed can spread as quickly as spotted knapweed, but Russian knapweed spreads much slower. Yellow starthistle (Centaurea solstitialis L.) is also a member of the knapweed family and is discussed in a separate bulletin (W-1411). Knapweed infestations in North Dakota have been found primarily along highways, waterways, railroad tracks, pipelines and recently constructed utility lines. 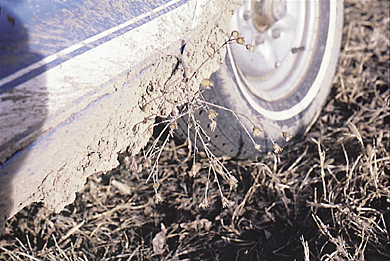 Knapweed often spreads to a new site by seed in hay, on vehicles, or in contaminated seed (Figure 1). Watch for new infestations along any publicly traveled route, where livestock are fed, or in disturbed areas. Control methods vary depending on the knapweed species and proper identification is the first step towards stopping the spread of these noxious weeds. Figure 1. People are the major cause of knapweed spread from one location to another. Inspect vehicles, hay, gravel, etc. carefully if they have come from a knapweed infested area. Spotted knapweed [Centaurea stoebe L. spp. micranthos (Gugler) Hayek]. Spotted knapweed is an aggressive, introduced weed species that rapidly invades pasture, rangeland, and fallow land and causes a serious decline in forage and crop production. Spotted knapweed has few natural enemies and is not preferred by livestock as forage. The sap of spotted knapweed can cause skin irritation in some people. Spotted knapweed infestations in North Dakota can largely be traced to seed or hay brought in from neighboring states. Researchers in Montana have observed that spotted knapweed may remain in a confined location for several years and then spread rapidly to adjacent areas. It is important to control spotted knapweed plants when they are first observed and monitor the site for several years to prevent reinfestation from seed. Spotted knapweed generally is a short-lived perennial, reproducing solely by seeds. It is a prolific seed producer with 1,000 or more seeds per plant. 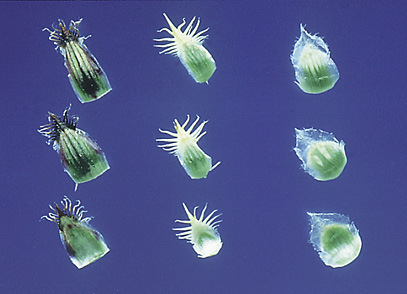 Seed remains viable in the soil five years or more, so infestations may occur a number of years after vegetative plants have been eliminated. The seeds can germinate from spring through early fall. 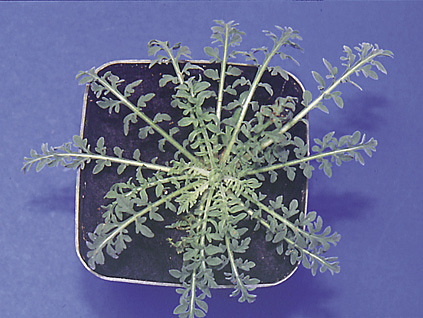 Seedlings emerging in the fall often overwinter as a rosette of leaves, resuming growth again in the spring (Figure 2). Rosette leaves are deeply lobed. The plant grows 2 to 4 feet tall and can have one or more stems with pale green leaves which are 1 to 3 inches long. The surfaces of the upper leaves and stems are rough. Flower heads are solitary and produced from early July through August. Flowers are pink to light purple (rarely cream colored) and the petals are surrounded by stiff, black-tipped bracts, giving the flower head a spotted appearance (Figures 3 and 4). The black tipped bracts found below the flower petals are the key feature to distinguish spotted knapweed from other knapweed species. Figure 2. It is very difficult to distinguish knapweed species based on the rosette alone. Spotted knapweed is deeply divided with wide lobes (top), diffuse knapweed has more finely divided lobes similar to carrots (middle), and Russian knapweed is seldom divided, has a “rabbit ears” appearance, and is a perennial (bottom). Diffuse knapweed (Centaurea diffusa Lam.). Diffuse knapweed is generally a short-lived perennial or biennial in North Dakota and invades habitats similar to spotted knapweed. 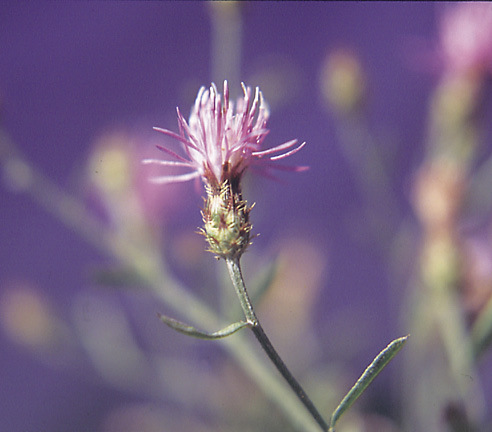 Diffuse knapweed was found in one North Dakota county in 1996 and infested approximately 20 acres. Diffuse knapweed had spread to four counties by 2017 and infested nearly 750 acres. The physical appearance of diffuse knapweed is similar to spotted knapweed, except diffuse knapweed is generally shorter and more highly branched. Also, rosettes of diffuse knapweed have more finely divided leaves than those of spotted knapweed (Figure 2). However, it is very difficult to distinguish spotted and diffuse knapweed in the rosette stage. If the plant is not flowering, search for last seasons flower stalk and identify the plant based on the flower bracts. Flower bracts are the key distinguishing feature between spotted and diffuse knapweed. Diffuse knapweed bracts have a rigid terminal spine about one-third of an inch long with four to five pairs of shorter, lateral spines (Figures 3 and 4). The spiny bracts resemble a crab in appearance, are very sharp, and can puncture skin if touched. 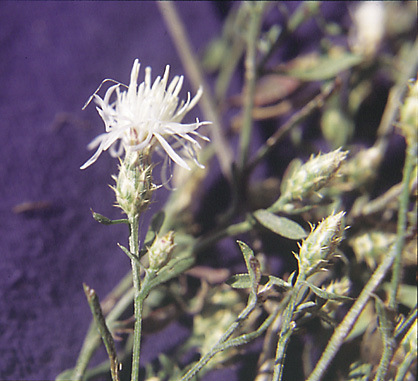 The flowers can be white or purple, so flower color is not a distinguishing feature between knapweed species (Figure 5). Diffuse knapweed flowers from July to September. Russian knapweed [Rhaponticum repens (L.) Hidalgo]. Russian knapweed has infested approximately 2100 acres in seven counties in 2017. It also is the only perennial of the noxious knapweeds and is the most difficult to control. The largest infestations generally are found in southwestern North Dakota. Russian knapweed is adapted to poorly drained and saline/alkaline soils. It is often found in areas with a supplemental water source such as the Little Missouri and Heart Rivers in North Dakota. Russian knapweed will also infest roadsides, pasture, and rangeland and is the only knapweed in the state that causes significant losses in cropland. Russian knapweed is a long-lived, deep-rooted perennial with growth characteristics similar to Canada thistle. The weed emerges in the spring from roots and grows 1 to 3 feet tall (Figure 2). Once established, Russian knapweed spreads mainly by underground root stocks as seed production is limited compared to other knapweed species. Two key characteristics distinguish Russian knapweed from spotted and diffuse knapweed. First, the flowers have rounded bracts with transparent tips (Figures 3 and 4). 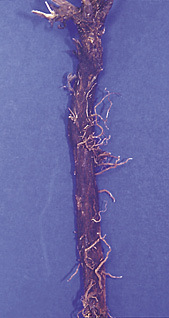 Second, the root of this perennial is dark brown to black in color, scaley as if the plant had been burned, and can grow to depths of greater than 20 feet (Figure 6). 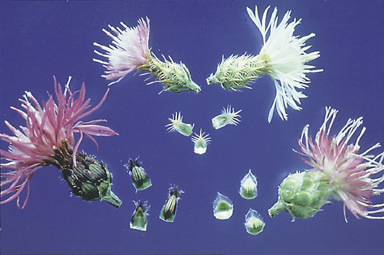 The flowers of Russian knapweed vary from light pink to lavender (Figure 3). Flowering occurs from June to September. People are the major cause of knapweed spread. 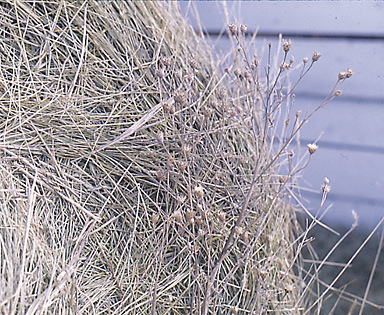 Knapweeds are spread readily in hay and on vehicle undercarriages. Producers should exercise caution when using hay from road ditches and when purchasing hay from known infested areas in neighboring states and provinces. Land managers must learn to identify knapweed on their own and neighboring land, especially on disturbed sites, pastures bordering roads and streams, and where hay is fed. Timely control of a few plants will be very cost-effective compared to treating larger acreage later. The public can assist county weed officials in controlling knapweeds by reporting all suspected infestations. Figure 3. Spotted knapweed has stiff black tip bracts with purple flowers (left), diffuse knapweed has both purple and white flowers and bracts with rigid sharp spines (center), Russian knapweed has pink to purple flowers with opaque bracts and the flower heads are generally larger than the other two species (right). Small infestations. Spotted and diffuse knapweed confined to small, well-defined areas should be pulled by hand or treated with a herbicide as soon as detected to avoid spread of the weed. First, all visible knapweed plants should be removed and destroyed by burning or mulching. Then the areas should be treated with a herbicide to prevent reinfestation from seedlings. Anyone working with spotted knapweed should wear protective gloves and avoid getting sap from the plant into open cuts or abrasions. Workers should wash their hands and exposed skin with soap and water following contact with this plant. Treat an extra 10 to 15 feet around the knapweed patches to control roots and seedlings. A careful follow-up program is necessary to control missed plants and seedlings. Many attempts to control knapweed have failed because follow-up treatments were not applied. Consult Extension Circular W253 “North Dakota Weed Control Guide” for additional information concerning herbicides for knapweed control. Pasture and rangeland. Herbicides will control spotted and diffuse knapweed plants and seedlings for two to three years. The residual control period may be shorter on gravelly soils and where soil organic matter is high. The optimum application time is when the plant is in the rosette growth stage in the fall or in the bolt to bloom stage in the spring. Consult the herbicide for use and grazing restrictions. Spotted and diffuse knapweed are generally easy to control with herbicides. However, a treated area must be monitored for several years and retreated as necessary for seedling control. Figure 4. The most reliable way to distinguish the knapweed species is by the bracts. Black-tipped bracts of spotted knapweed (left), spiny crab-like bracts of diffuse knapweed (center), and transparent tips of Russian knapweed. Figure 5. An example of why flower color cannot be used to distinguish knapweed species. Note the spiny bracts on both the purple and white flowering plants. They are both diffuse knapweed. Figure 6. 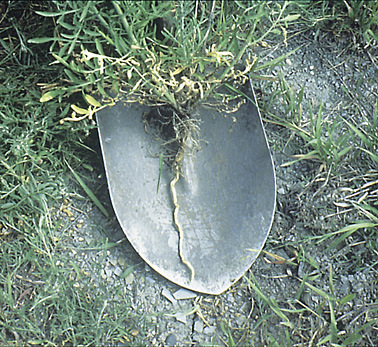 The roots of spotted and diffuse knapweed are taproots similar to dandelion and off-white in color (left). Russian knapweed roots are brown to black in color with a scaley, bark-like appearance and because it is perennial have root buds (right). Russian knapweed is one of the most difficult perennial weeds to control. If the plant is found in cropland, then a combination of cultivation and herbicide treatments will suppress the plant. However, herbicides at labeled rates for cropland use will not control Russian knapweed. Small patches in pasture and rangeland. Russian knapweed is best controlled when herbicides are applied following several hard frosts (usually mid-October). The plants will look dormant with grey stems and no leaves, but control the following growing season has been excellent with herbicides applied very late in the growing season. Application in mid-September or during flowering in mid-summer generally provides shorter-term control. In general, the knapweed infestations are small enough that herbicide and hand removal are the best and most cost-effective treatments in North Dakota. Attempts to control spotted and diffuse knapweed with insects have been in progress since the 1970s. To date, 13 insects have been introduced to control spotted knapweed and nine insects have been released on diffuse knapweed. Urophora spp. flies feed on the seed while Larinus spp. beetles attack the stems of knapweed. Larvae of the beetle Cyphocleonus achates (Faraeus) feeds on the roots and has been the most successful agent in reducing established knapweed stands. Two gall forming insects have been released to control Russian knapweed, but will not reduce the spread from roots of this perennial weed. The best knapweed control is prevention, and to keep an infestation from becoming established you must correctly identify the plant. 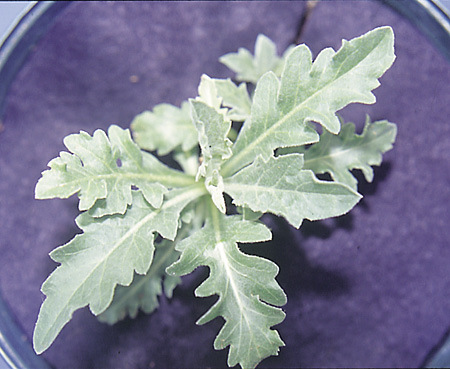 Small and young infestations of knapweed are generally easy to control with herbicides. However, an area must be monitored for several years and retreated as necessary for seedling control. Consult Extension Circular W-253 “North Dakota Weed Control Guide” for additional information concerning herbicides for knapweed control. Photos 1, 2, 5 and 6 by Rodney G. Lym. Photos 3 and 4 courtesy of Dr. Steve Dewey, retired, Utah State Univ., Logan.